Following the successful Dublin launch by Mícheál Ó Doibhilín in Richmond Barracks on July 19, Liz Gillis' latest book - "The Hales Brothers and the Irish Revolution" was formally launched in their home town of Bandon on Saturday July 30 before a massive crowd of several hundred. The book was launched by Dr. O'Driscoll of UCC before the appreciative audience, among which were many members of the extended Hales family. "The story of the Hales family from Bandon epitomises the whole revolutionary period in Ireland. They were involved from the establishment of the Irish Volunteers in West Cork and were closely associated with well-known revolutionary figures, including Michael Collins, Tom Barry and Liam Deasy. Both Seán and Tom were company commanders in the IRA in the area. The signing of the Anglo-Irish Treaty in December 1921 split the family and led to the two brothers taking opposing sides in the Civil War that would follow. Tom Hales was the most senior Republican officer on the scene of the chaotic ambush at Béal na mBláth that led to the shooting of Michael Collins. Seán Hales was himself assassinated in Dublin by Republicans, following a vote in Dáil Éireann to allow the Provisional Government to increase its powers to penalise Republican prisoners. 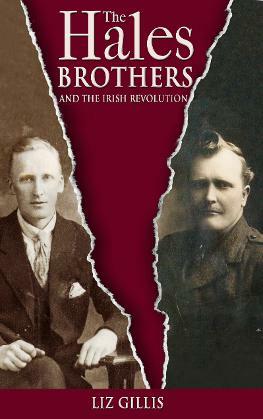 The story of these brothers and the rest of the family gives a unique insight into life in Ireland in this tumultuous period". This is historian Liz Gillis' fifth book, and once again she concentrates on telling history through the eyes of those who lived it, giving a human slant and unique view of momentous events and violent times. No-one who reads this magnificent book will remain unmoved by the sacrifice those who fought for our freedom made, and they will have gained a valuable insight into the times and beliefs and personnel involved.